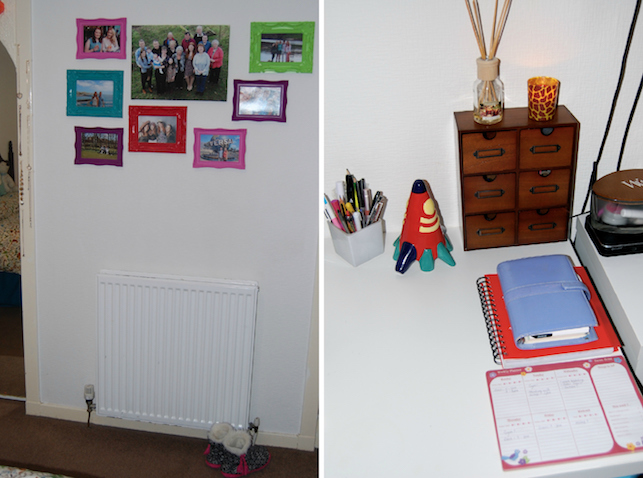 I published my first bedroom tour post back in May 2014 and my bedroom at home is more or less untouched so when I go back it really does feel like home. Since then though I have lived in student halls in Aberdeen, I still regret not getting round to doing a room tour there, and for the past year and a half I've had my own flat near the uni with my flatmate Eilidh. I (naively) thought I could get a room tour published in the first few months of living here but it never happened. Recently I finished my gallery wall so I felt like it was finally ready. It took a little of time to make this place feel like home, and although it is still just a student flat to me, I really like the way my bedroom is. It is worth noting that just before I moved in my mum and I painted the walls from a dirty white to a bright clean white. The only furniture that was in the room was the bed and a chest of drawers which is now in the wardrobe to save space. The bedside tables, desk, desk chair and book case is all mine. Along with the bright curtains, bought from Amazon, to replace the awful dark ones that were there before. You'll have seen this bedding in the background of blog photos before but I have two sets - this one is from Asda who do great bedding and my geometric bears are from Primark. The two bears on my bedside table are from Scott, I love my batman meerkat and perri my polarbear has a special place in my heart. Both my bedside tables are Ikea via gumtree and I picked them up for £15. Crucial for storage and bedtime essentials like my book, lamp, alarm clock and phone. This cute little bowl was a gift from my flatmates holiday in italy last summer and I keep jewelry, kirby grips and odd bits in it. The other side of the bed is where my boyfriend sleeps so I don't normally go near that table but for decoration I have a pink Ikea lantern and a photo of my mum and dad in a frame. Beside my bed I have two plastic boxes for storing my scarfs and underneath my shoes. Also normally found here is my reading pile and camera bag. 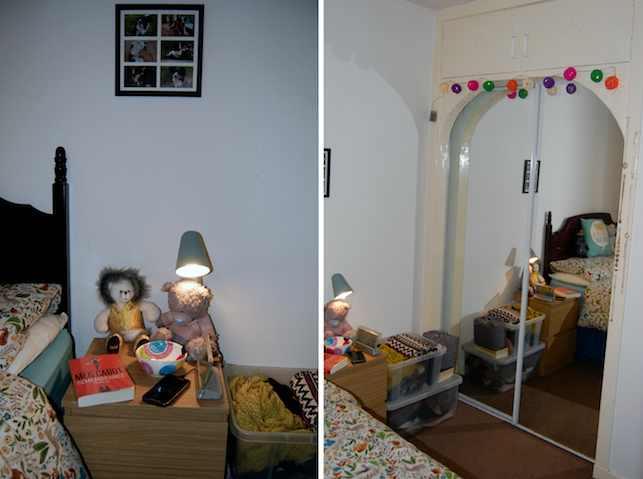 You can also see my fitted wardrobe with two mirrored doors (a must for me). It is a pretty big space when you open it so I might do a separate wardrobe tour at some point. Around it I have hung up fairy lights because I'm basically a cliche. Down the right hand side I have hung up my most worn necklaces in a sort of decorative way so they don't get forgotten about. Now the necessary part of any student bedroom - the desk! I do the majority of my uni work sat here. In first year I bought this kallax from Ikea to give me more storage space and it hold the books and folders I use post often as well as stationary and little essentials. My white desk top also came from Ikea and my dad helped me paint and screw on these legs. Luckily for me my neighbours were chucking out a desk chair just as I was looking to buy one. I've always been against having a TV in my bedroom but last year my boyfriend finally persuaded me into it. When he is over (and my flatmate is home) we spend a lot of time watching TV in my room and it is just so difficult on a 13" laptop. Honestly don't know how we coped without it for almost two years. Although we have a TV licence it isn't cabled in so I stream catch up TV via my boyfriends droidbox. I'm so proud of my colourful gallery wall - the frames were bought gradually from B&M and Home Bargains for £1 each and I filled them with my favourite photos. The canvas print came from Snapfish and is the family photo from my 21st birthday party last year. There are some essentials that I use almost everyday that sit on my desk like my filofax and lecture notes. I also use a week planner pad to keep track of my thoughts. The cute space ship money bank came from Paperchase and stores loose change. These wooden drawers were bought from Asda to hold the tiny little things that normally get lost like kirby grips, bobbles and memory sticks. I knew I wanted a cork board in my room and began saving corks before I moved in. Still it took me months to collect enough to fill this frame (I just removed the glass). I keep vital notes pinned here as well as little keepsakes. Yes that is a Christmas card but it is also a Geology pun I find funny - thanks Eilidh! Above my desk I have another frame with photos, mainly, of first year. The plaque says "I smile because I have absolutely no idea what's going on" which sums up my awkwardness so well. The black board I bought from eBay and the 7x5 grid I drew on allows me to use it as a calendar and rub it clean each month. I like to see at a glance what I have on which day. This post has been so long so thank you if you got to the end. If you'd like to know where anything is from please ask in the comments or tweet me. I'd also like to add that although a few things are nailed to the wall, the cork board and the TV (obviously), I use alot of Command Decorating Clips and Command Picture Hanging Strips. A little disclaimer - although my room isn't always this immaculate this is what is looks like the majority of the time. I like to be tidy (so does my other half) and a cluttered space would drive me mad.